GRISS researcher Josep Maria Martí participated in the round table of the Mercat de l’Audiovisual de Catalunya 2017. In the session, moderated by Jordi del Río (General Director of Media in Generalitat), Saül Gordillo (Director of Catalunya Ràdio), Xantal Llavina (journalist) and Josep González Bayo (Director of Ràdio Arenys) also participated. 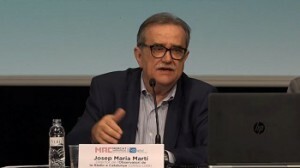 The event took place in the Mercat Audiovisual de Catalunya 2017. The assistants had the chance to pick up a copy of the Informe sobre la ràdio a Catalunya 2012-2014. The book, carried out by the Observatori de la Ràdio a Catalunya, that asses the progress of broadcasting, and is the only regular and comprehensive study on the sector throughout the state. The writting process was also carried by the researchers Belen Monclus, Carles Llorens and Xavier Ribes, as well as Josep Maria Martí.